Thinking back on our visit to Taipei last March, I can't believe how unprepared we were for that trip. We had no game plan: basically, we boarded a plane in Vancouver and landed in Taipei. We had a hotel booked and we knew we had a wedding to go that week -- but that was about it. We had no itinerary planned, didn't even do any research whatsoever. So, we wandered and meandered through the streets of Taipei. 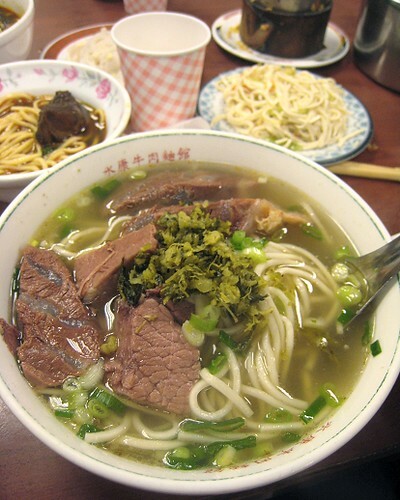 Of course, we had to have (Taiwan) Beef Noodle Soup! 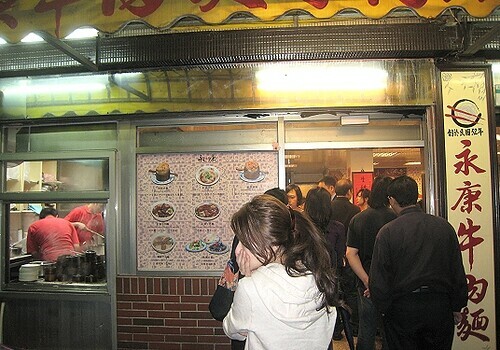 We tried several beef noodle shops; this is their story. Our first day in Taipei, we went to Taipei 101. It is apparently the big tourist-y structure to see, but I was unclear what it was exactly that we should see there. I figured it was a big building -- and I feared it would be just another big mall. 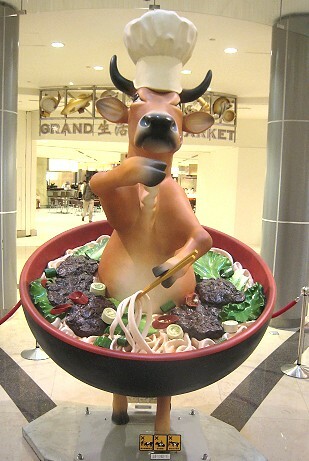 Just to show how beef-noodle-crazy the city seems to be, here's a funny statue in Taipei 101. The cow is eating noodles in soup made from himself! 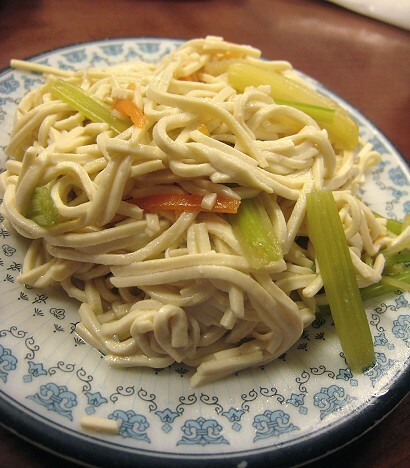 It's a cow in its own broth, complete with noodles and vegetables. 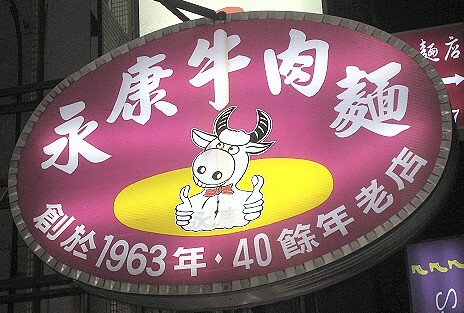 I guess they do take their beef noodles quite seriously. I don't know what this food stall is called. Please refer to its name in the photograph. There was a Food Court in the basement of Taipei 101 and we decided to eat first before going on our way. I must say, food courts in Taipei are a different animal from food courts in North America. It seems to me that they still serve "real food", only quicker, not mish-mashed corn ingredients masquerading as food. By the way, Taipei 101 is just a big mall. There's the observatory, but it was teeming with scary, unruly tourist groups, so we didn't bother. Therefore, our visit there was very short. 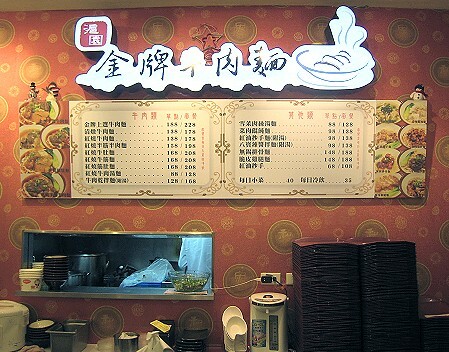 We bought a bowl of beef noodle soup from the stall pictured above. 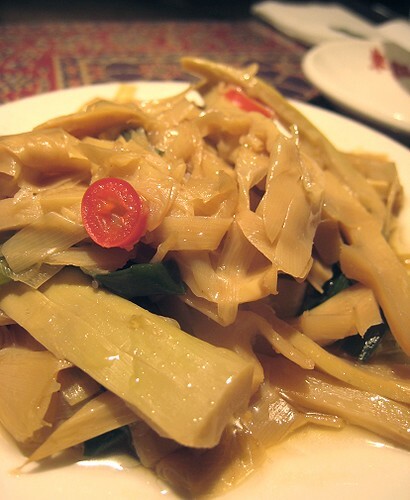 We piled on the pickled mustard greens on our noodles and away we slurped. 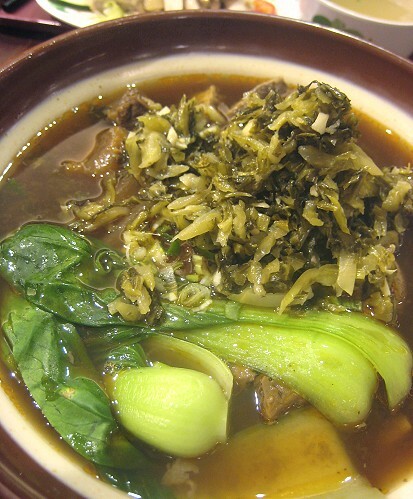 While the beef noodle soup was better than average and had a healthy portion of bok choy, the broth here had a hint of that "Chinese medicine" taste which we both didn't particularly care for. Our second day, we finally got one of those free maps being given out by Metro Taipei, the subway system. One of the places the Metro map suggested to go to was the Ximending 西門町 area, which was a "fashionable" part of town, full of "youthful lifestyle." 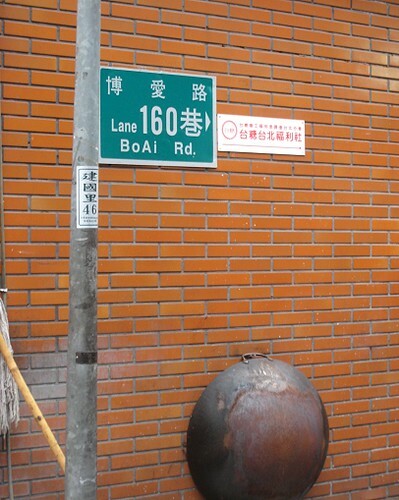 We also saw the little letters on the map telling us that one of the streets was the "Street of Beef Noodle." 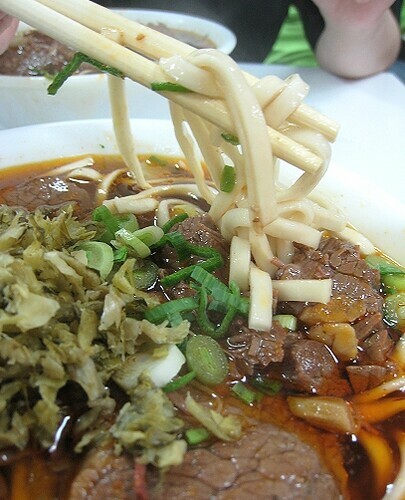 We're not exactly sure if we got onto this street of beef noodle but we did end up in a beef noodle shop with no name. TS put up two fingers to indicate that there were 2 of us going to be eating. When the owner/waiter never returned with the menu or anything else for that matter, we were starting to get antsy. Were they going to let us order or are we supposed to just sit here? 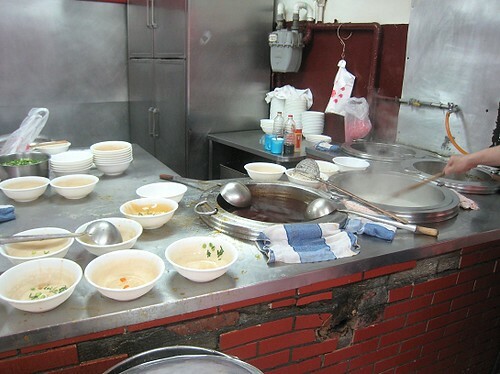 After about five minutes, we had two steaming bowls of beef noodle soup. Apparently, TS's peace sign already signified our order of two bowls! Ooooh, pickled mustard greens, so plentiful! 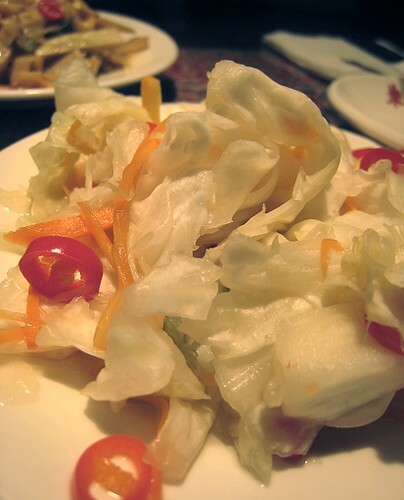 I loved the fact that they had a big container of the pickled mustard greens on the table. 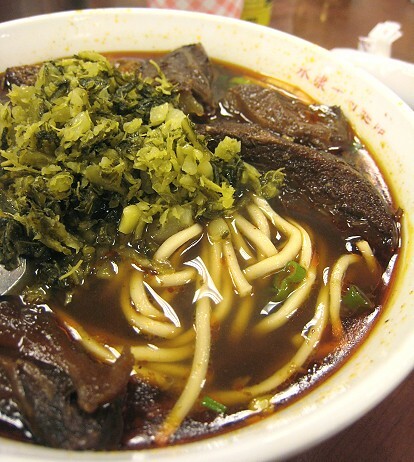 In Vancouver, most beef noodle joints are very miserly with their pickled mustard greens. In Taipei, it seems they just give it away. I can't really remember how this tasted exactly, except that it was very good. Umm, yeah, that's about it: it was very good. 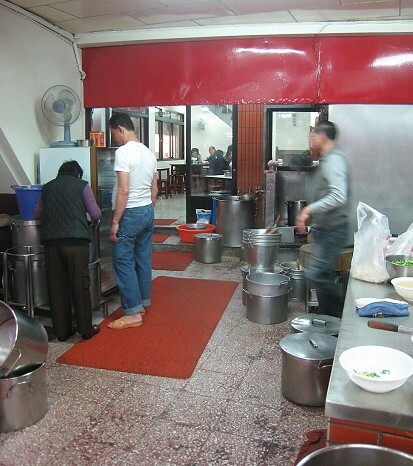 We went into the restaurant via a side alley entrance, and it was only after eating that we discovered their "kitchen" outside the other door. We looked around a bit, trying to see if they had some sort of signage, but it seems that they didn't. So, I took a picture of the street sign to take note of the location. 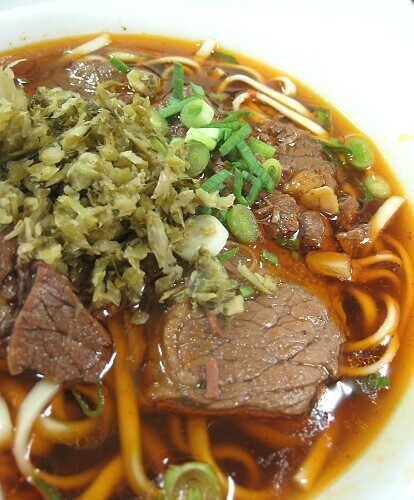 For our 3rd taiwan beef noodle experience, AL -- the bride whose wedding we were attending -- took us to her favourite beef noodle place. It was a busy place; full house! 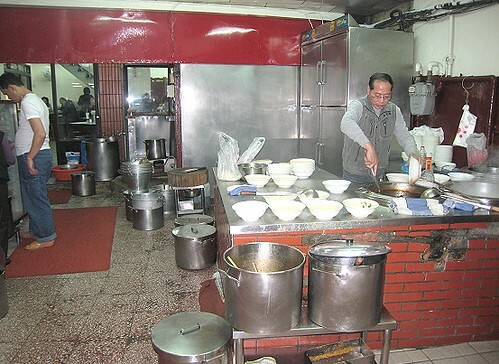 There was another place a few doors down that supposedly won the title of "Best Beef Noodle Soup" in Taipei's annual beef noodle soup contest, but AL scoffs at their "win". She thinks they might've bribed the judges or something, teehee. She's bitter that Yong Kang did not win. I must say, though, that when we walked past the other restaurant, only about 30% of the tables was occupied. We sat at a communal table. That's a portion of our table. 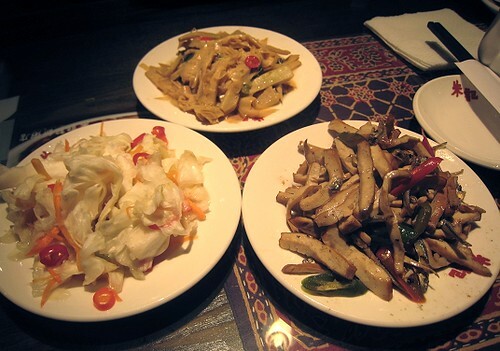 The little plate of noodle-like items in the background is tofu. Tofu "strings"/"strips." Simply marinated. Very nice and refreshing. This was served room temperature or cold. 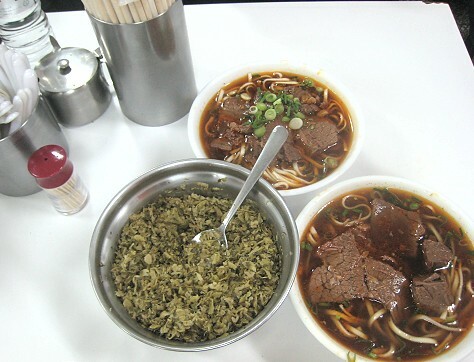 Oh, typically, beef noodle places (and other places as well) in Taipei have several "side dishes" on offer. 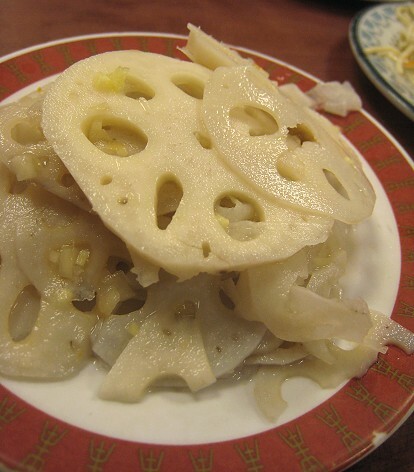 Marinated lotus root. Again, very nice and "refreshing", as it was also served room temperature/cold. In general, most of these items are generically called "marinated". At least, that's the translation I see often. Steamed spareribs with rice "powder". 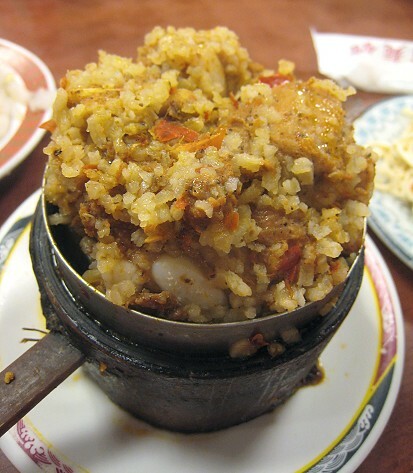 The rice "powder" is ground-up rice with various added flavorings/spices. It comes in a mini bamboo steamer with a handle. This was served piping hot, of course! The "unknown restaurant" also carried this item; we just didn't order it that time. 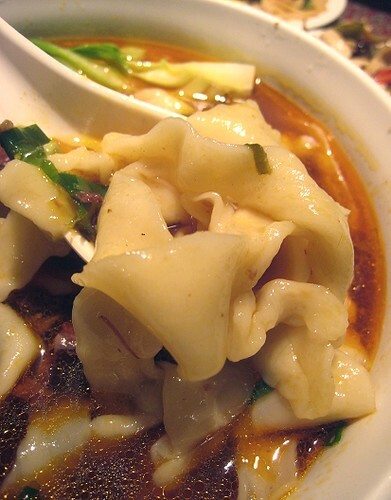 You may be wondering, "Why is the beef noodle soup so pale?" 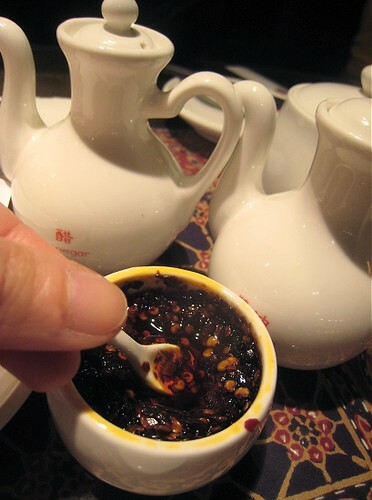 Well, in most places, beside the dark "hong shao" (紅燒, aka "red cook") beef broth, they also carry a plain clear broth. I was very curious about this plain clear broth after seeing it on various menus. I asked AL: "What does the plain one taste like? Should I order that instead?" I should say that when I asked this question, I was very much visibly torn and confused, with my heart yearning for the hong-shao noodle soup, yet my curiousity incredibly piqued by this clear broth. AL did not help much. "It's just a clear broth. If you want to find out what it is, why don't you just order it, then." I mean, it was all right and all, but obviously, it wasn't that rich, complex hong-shao type broth I was looking for. 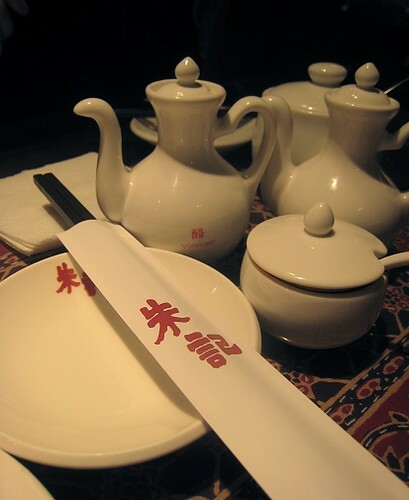 I looked enviously at both AL's and JS' bowls of hong-shao beef noodle soup all throughout the dinner, feeling quite sorry for myself. Food place at "The Mall"
Our last day in Taipei, we were too lazy to venture too far out of our hotel. Our hotel is situated beside The Mall. Like every department store, it has a food court in the basement. 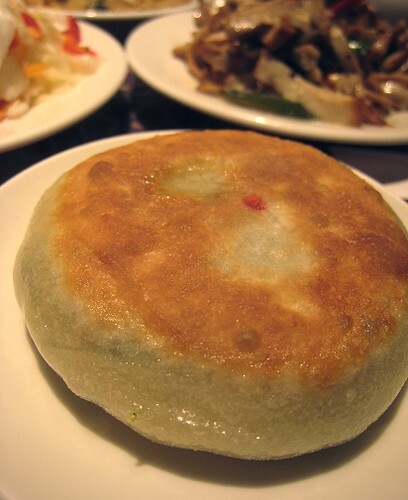 We've eaten at several other food stalls in The Mall, but this time, we chose the Taiwanese place. I must reiterate that as JS has mentioned, eating at these food courts is nothing to be ashamed of! ;) Actually some of the food places in these food courts are full-fledged restaurants. This place was kind of a restaurant. Oh, if you go to "The Mall" website, then select About > Floor Directory > B2, this is the 6th item on that list of stores/restaurants. That teensy-teensy, tiny spoon was adorable! Once again, we decided to get some sides. 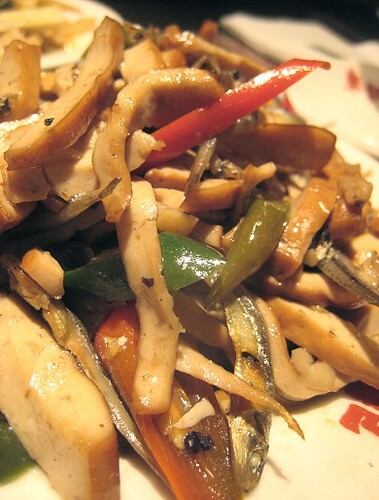 Tofu and various vegetables with these small fish. Look at that goodness! I don't exactly know what type of vegetable/herb is in this. 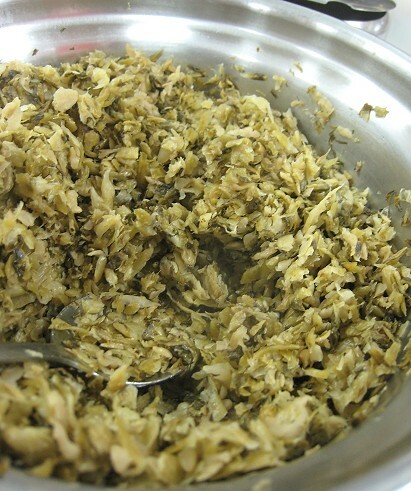 The filling also had mung bean threads/noodles, and possibly chopped tofu. What am I forgetting? 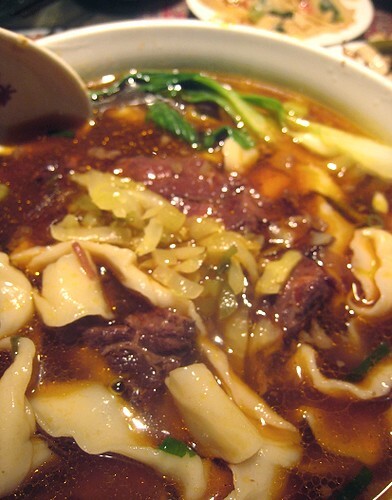 Oh yes, the beef noodle soup! Our order sheet. We were quite happy to see they had "knife-cut" noodles. 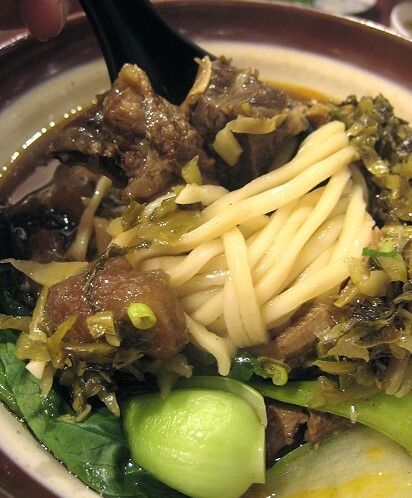 Lo and behold, our bowls of beef noodle finally had these more rustic and chewy noodles. 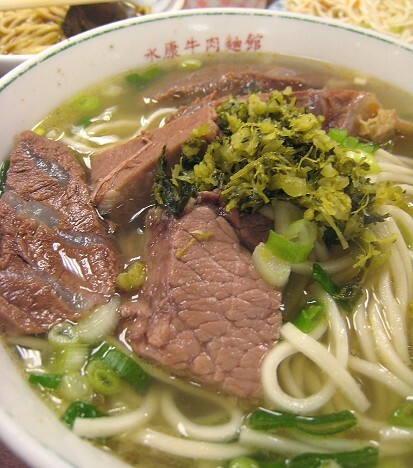 That was one thing I was missing from all the other beef noodle soups that we tried. Finally, my QQ dreams were fulfilled! These noodles were so nice and chewy. All in all, we didn't eat any awful bowls of beef noodle soup during our trip. Oh my god.........................you make me homesick. 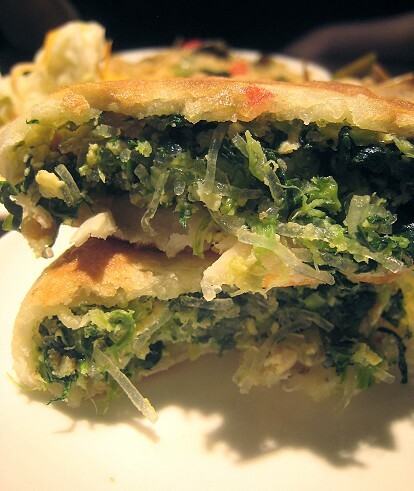 The vegetable in that pan fried bun is chives. So much food! I also tried a few good Taiwanese beef noodles but almost forgotten all the names of the stalls! I'm glad you finally got your QQ fix! omg everything looks so delicious! 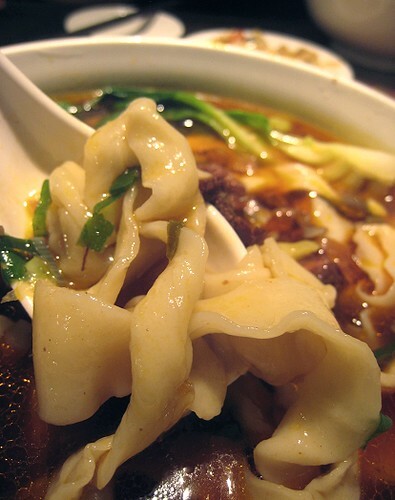 I really want to try those beef noodles! 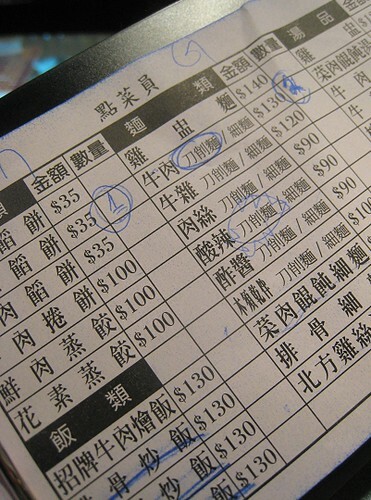 The snacks/quick eats (小吃)in Taiwan look wonderful. And food courts in Asia are much better than the ones we find here in NA, ya?